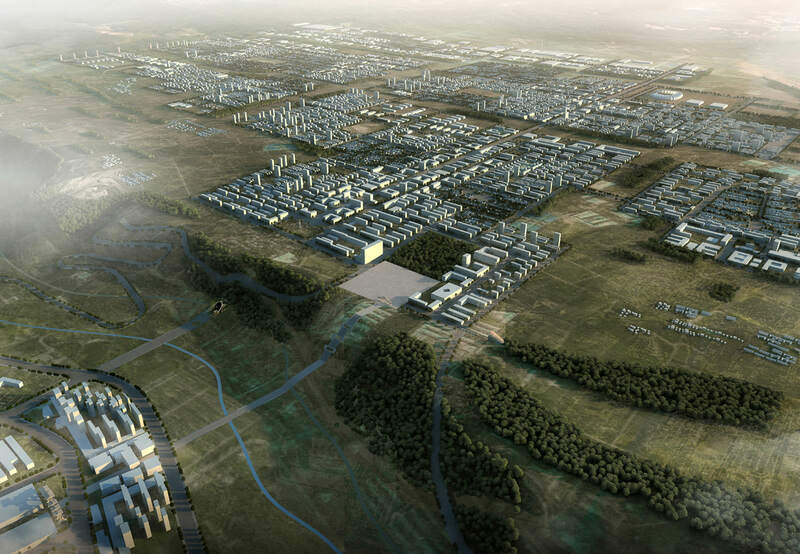 An interdisciplinary group of experts designed this new eco city, located on a plateau 200 m above the existing city of Baoji in Shaanxi province. The basic question at the beginning of the design process was about the leading concept of a new city at the threshold to the 21st century. The challenge of resource and energy shortages and the ambition to design a livable and sustainable city were the driving forces for the design process. The acceptance and the valuation of the existing is one of the main preconditions of satisfaction. The initial situation with existing settlements, mainly characterized by the vernacular, agricultural life, will be untouched at the beginning and be urbanized and transformed in a later phase respecting the specialty of the place and its tradition. The new city will be characterized by mixed use, compact and diverse settlements, short traffic routes and make appropriate use of materials, energy and resources. A diverse and efficient public transport system, including a bus network, light railway and cycle lanes, is implanted in the new city and connects Baoji Green Dragon City with Baoji. Efficiency is also the key word regarding the water resources. Special focus is set on water saving, storm water management as well as the topographic position of the water-maintaining infrastructure. The ambitious and radical aim of a CO2 neutral city requires a radical change in terms of energy management. Beside the economic possibilities of combined generation of heat and power connected to a decentralized district heating network, solar photovoltaic roof installations, wind turbines and waste-to-energy systems have been implemented. The nationwide energy management has to be rethought and a path for connection of decentralized electricity generation to the electricity grid of China to be opened. Using the public grid for storage of surplus electricity the goal of a true zero carbon balance city is achieved. The new city preserves nature, respects local culture and sets new standards in terms of energy production and the use of resources. An immense step towards a new green future and a forward-looking way of life in a happy city. The study was accepted by the Baoji Rural and Urban Construction and Planning Bureau and is serving as a basis for further planning activities by the bureau.